Zippy Embroidery are based in Grantown-On-Spey. We have been producing top quality garments for business's, clubs and schools for many years. We have supplied many thousands of school uniforms for the local schools in the area and are a specialist embroidery company. 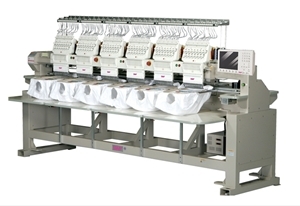 Embroidery machines can breakdown and this can be a problem for other suppliers. We can ensure continuous supply even in the event of a breakdown as we have 4 independant machines of various sizes which apart from ensuring our order are run on time it also gives us the flexibility to run different designs simultaneously. Zippy Embroidery use only the best quality threads. We use threads manufacturered by Madeira as the colours can be guaranteed wash after wash.
Grantown Grammar School, Grantown Primary School, Grantown Playgroup, Aviemore Primary, School, Abernethy Primary School, Deshar Primary School, Carrbridge Primary School and Carrbridge Nursery.